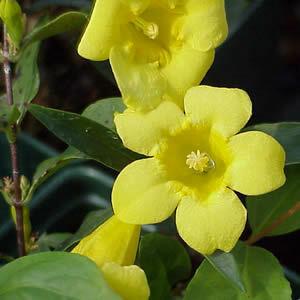 Gelsemium sempervirens has glossy green leaves with small yellow trumpet flowers that are fragrant. Carolina Jessamine is an evergreen vine that will flower both in the spring and fall and will reach a height of 10 feet. It can be trained to grow on fences, walls, or other structures. Gelsemium sempervirens is a Texas Native, native to the eastern portion of the state!